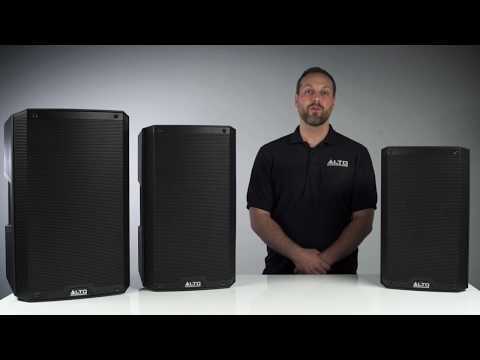 The Alto Professional TS212 Truesonic 2 Way Powered Loudspeaker offers the best of both worlds - exceptional performance at an affordable price. The team at Alto Professional have gone to every effort to ensure that working professionals have every feature they could possibly need in an easy-to-use interface, making life on the road significantly easier. The TS212 can produce a healthy continuous output at 550W, with a peak output at 1100W - more than enough for the most demanding of performances. Whether you're doing sound reinforcement in small, medium or large venue, you can rest assured that everything from speech only to a full-band will be output with absolute clarity - even if you have to give the output a push. Low frequencies are handled by the 12-inch low frequency driver with 2.5-inch voice coil. High frequencies are distributed by a 1-inch neodymium driver that incorporates Alto's proprietary precision waveguide technology. The high-performance capabilities are enabled by the internal Class D power amplifier, which prevents unwanted overheating due to its efficient performance. Thanks to some exceptional engineering, everything remains cool so that the need for an expensive fan system is negated, enabling the speakers to generate sound - not heat. The system is therefore cleaner, quieter, and considerably more reliable. With live performance comes all the abuse that transportation and elements of the venue can bring. Sometimes it's the flying drumstick, a falling mic stand or worse. The TS212 is equipped to handle any danger that may befall it from top to bottom, with a solid metal grill that protects not only your low frequency driver, but your high frequency driver as well. The Truesonic TS212 speaker cabinet has been designed with versatility and longevity at the forefront. The lightweight yet highly resilient polypropylene enclosure is both mountable and flyable - thanks to the professional-grade M10 rigging/suspension points - depending on the needed application. There are five integrated handles that allow you to pick up the cabinet with ease, sparing your back when loading in/loading out of venues. In addition, the trapezoid design keeps resonance at an absolute minimum to keep the sound as pure as possible. The Alto Professional TS212 Truesonic 2 Way Powered Loudspeaker was designed from the ground up to be as reliable as possible. Rigorous testing and thousands of hours of listening have gone into making sure that your signal is replicated with unparalleled clarity. Everything from the internal signal path to the components used, the sculpted cabinet to the meticulously designed waveguide technology, are developed with accuracy and reliability in mind.